As we entered 2017, we used the Trisolute News Dashboard – which provides real-time optimization data for news-related SERPs in Google, as well as Google News rankings – to take a look back at the top publishers in Google News U.S. for 2016. Now, we’ll look at which news websites can claim the top spots in search visibility for the first 21 weeks of 2017, specifically January 1 through May 30. We took a look at our new report, mobile visibility overall, as well as: mobile AMP Carousels, Google News and Google News boxes. They are ranked No. 1 through 5 in each category based on where they ranked in week 21. We’ll also look at the top 25 Google News topics so far this year. The top five U.S. news publishers for overall mobile visibility are in a tight race so far in 2017. This new report in the KPI Dashboard for mobile measures visibility in News Box Headline, News Box Text, News Box Carousel, Publisher Carousel and Newsticker. We looked at imported keywords, which consist of Google News Topics and Google News Related. There was quite a bit of variability in mobile visibility for January through May, especially with Yahoo and USA TODAY. Interestingly, there was a decline across the board for the Top 5 publishers. Unlike the following reports, data on overall mobile visibility only goes January-May 2016 instead of the entire year. With that in mind, we can say that the top 5 has changed quite dramatically: Yahoo has gone from No. 1 to No. 5, USA TODAY took over the top spot, the Guardian fell out of the rankings completely, and the Washington Post and New York Times moved up to make up for the Guardian. These publishers ranked on top for Google Mobile AMP Carousels in 2017 so far. As a subset of mobile visibility overall, AMP Carousels are of high interest to news publishers, as they are favored by Google in the search engine results pages (SERPs) when AMP articles are available. Again, we looked at imported keywords for this report. There are mostly familiar faces in AMP Carousels from mobile overall, with the exception of Fox News. 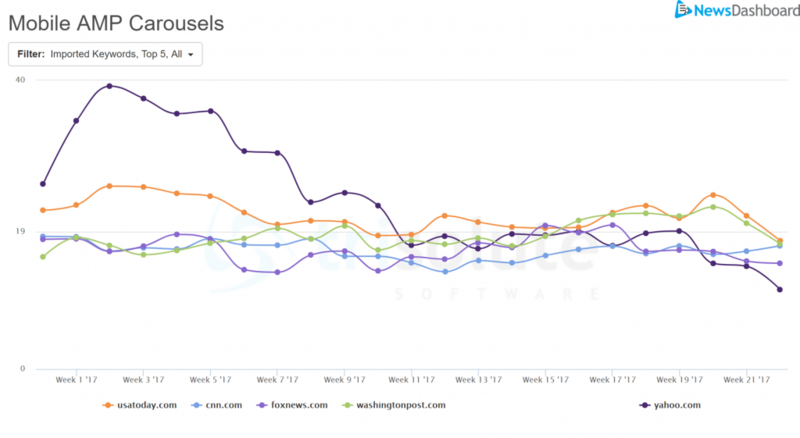 Once again, we see the biggest variability with Yahoo, which dropped in all mobile categories measured. And we also see a decline across the board. 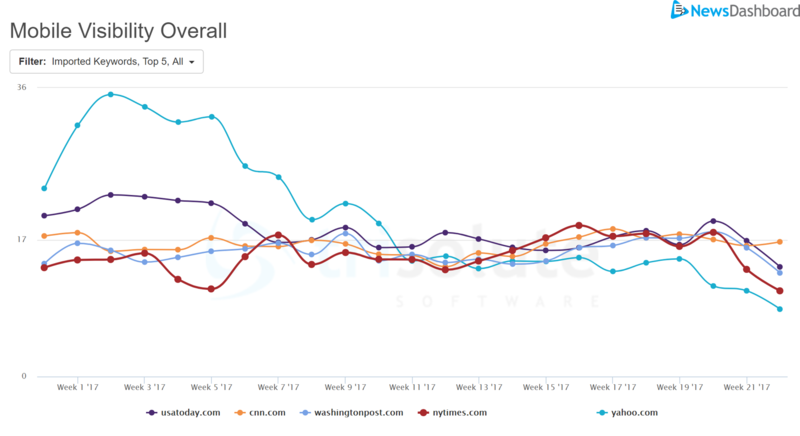 Compared with the 2016 status report on AMP Carousels, USA TODAY has overtaken Yahoo (which also experienced a significant drop in visibility over the course of last year). The Guardian, the BBC and the New York Times have dropped out of the Top 5 since 2016. The top five publishers in desktop Google News so far in 2017 are shown in the News Dashboard SEO tool. Unlike the mobile reports, we see more increases for publishers in desktop Google News, specifically the Washington Post (which almost doubled its search visibility in this major category) and ESPN. The New York Times stayed steady over the measurement period, while CNN dropped a bit and USA TODAY dropped by more than a third. Compared with the 2016 measurement, Reuters dropped out of the Top 5 and was replaced by ESPN. The Washington Post and New York Times retained their top spots in 2017; CNN recovered from a major drop in visibility at the end of 2016; and USA TODAY fell to the back of the pack. The top five publishers for the desktop Google News Boxes are shown for January-May 2017 in the News Dashboard SEO tool. We now looked at search visibility in the desktop News Boxes, drilling down to the headlines level. Yahoo’s precipitous decline rings true here as well, with gains going to the New York Times and CNN. ESPN and USA TODAY both made minor drops. Compared with 2017, the Guardian and the BBC dropped out of the Top 5 – similar to mobile AMP Carousels. Unlike the AMP ranks, though, New York Times has continued to top News Boxes instead of dropping lower. Using News Dashboard data, below are the top 25 Google News Topics in the U.S. so far in 2017. We looked at the Topics that have been picked up most often by our measurements every half-hour from Google News. No prizes for guessing the No. 1 topic: Donald Trump. The top 25 Google News topics so far in 2017 range from politics and U.S. news to world coverage, sports and entertainment. We see the tech world, space-related searches, NBA playoffs and finals, American politics and international news stories are well represented. 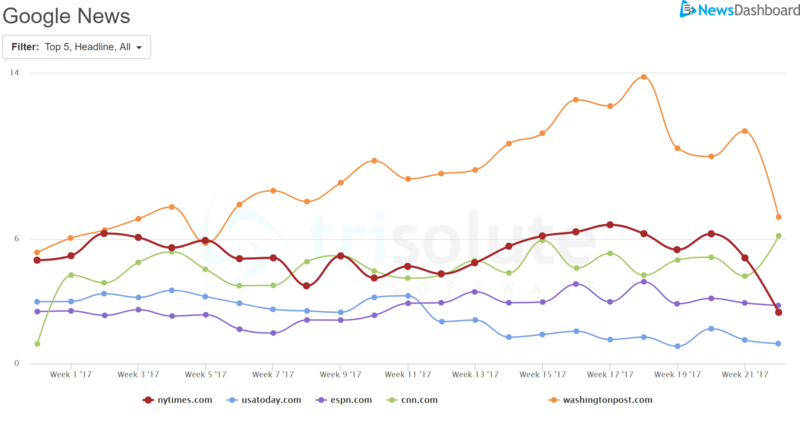 After looking through the News Dashboard data and at the news SEO, we can see that USA TODAY and CNN are the only publishers that made it in the Top 5 for all for categories we measured in this analysis. 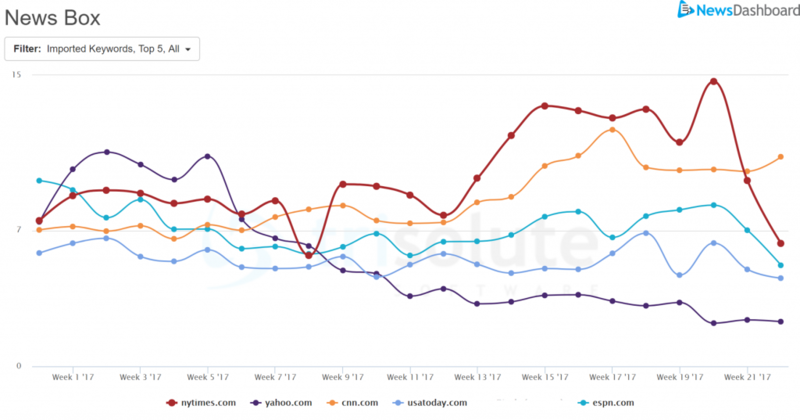 The Washington Post, the New York Times and Yahoo appeared in three of the categories, though Yahoo showed a steady decline in each category it ranked in. ESPN ranked in two categories, while Fox News only ranked in one. We hope this report on SEO for publishers proves interesting.